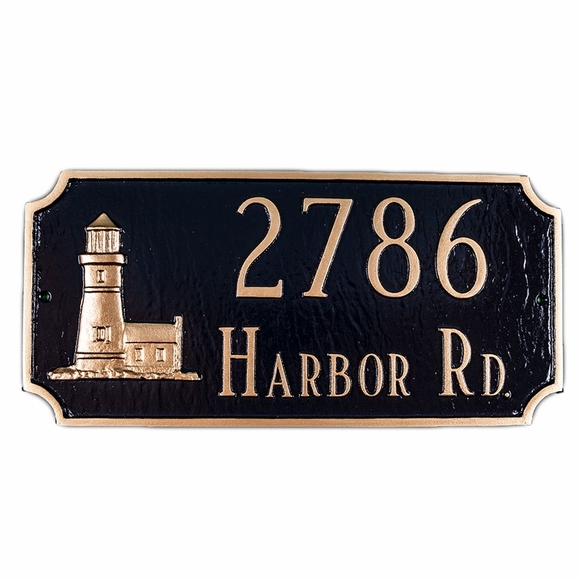 Personalized Address Plaque with Lighthouse - - wall mount sign includes a decorative lighthouse on the left side along with your two-line address on the right. Made in USA. Four curved-in convex corners enhance the rectangular shape. Both personalization lines hold up to 10 characters. Also available with two optional 24" lawn stakes for mounting in the ground. The address on the sample Lighthouse Address Sign above is 2786 HARBOR RD. Made in the USA.